Left to right: sgtwashburn, arrival blue 04, avalanchuck, RockyMtnShowtime, chadster, and JoeSpicoli at the start of the Garden of the Gods to Pikes Peak GTG September 2006. 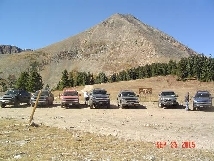 Left to right: Avalanches of Trail Ready Z71, JoeSpicoli, thorin, Colorado_Avalanche, avalanchuck, blueruck, and arrival blue 04 at the top of Georgia Pass on our Fall Colors Trail Ride GTG, September 2005. 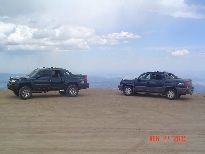 We are members of various online Avalanche forums that happen to live in Colorado! This site is for specific information pertaining to the Colorado members of the various forums. Hopefully this site will grow and serve as an excellent resource for Colorado area Avalanche owners. Colorado_Avalanche (left) and JoeSpicoli's Avalanches at the top of Pikes Peak on the Pikes Peak Run GTG, August 2005. A good time to get together & get lost with fellow Av owners and their families! 6th Annual Corn Maze GTG - Event Date: 24 Oct 2009 . Time to have a GTG & bowl a few frames with fellow Av owners! Details of the lunch GTG can be found here: Bowling GTG UPDATE! - Event Date: 21 Mar 2009 Hope you can join us! Time to have a GTG and meet some new members! Details of the lunch GTG can be found here: February 28th @ Rockyard Castle Rock @5pm - Event Date: 28 Feb 2009 . It's that time of year, Corn Maze time. Check out 5th Annual Corn Maze GTG - Event Date: 25 Oct 2008 for details on the GTG. Wanna see some nice fall colors? Then come along to the Fall Colors GTG-Peak to Peak Scenic Byway - Event Date: 04 Oct 2008 It's a very scenic ride and great opportunity for pictures! Hey, check out the thread on the next GTG: Knight Rider GTG @ Forney Museum - Event Date: 13 Sep 2008 Would love to see you there! Short notice but we're looking to do lunch in Castle Rock this coming Sunday: Sonic Lunch GTG - 13 Jul 2008 Please respond to the thread if you can make it. Left to right: Castle_Rock_Av, Bluruck, Impact, MrandMrsBurton, Gadget, MeanGreenAv (& Dad) with their Avalanches at the Apex! Chevrolet and Avalanche are registered trademarks of the General Motors Corporation.